Below: Echinodorus 'Rubin' is a cultivated variety of echinodorus. Many aquarium plants are "manmade" varieties, created by crossing separate species, which results in attractive, new hybrid plants. The leaves of Echinodorus 'Rubin' vary in color. A mixture of red and green areas, combined with visible veins, creates a distinctive plant. The red edging of this leaf is unusual and creates a good contrasting effect when viewed against other leaves and plants. Right: The narrow-leaved form of E. 'Rubin' is equally stunning, with the same unusual reddish coloration. These plants are relatively easy to care for, although they require very bright lighting and may grow to more than 20 in (50 cm). 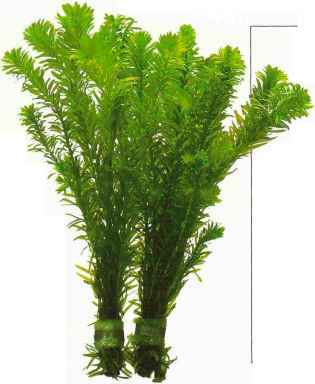 Below: E. schlueteri is an ideal specimen plant for a small aquarium. Although it produces large leaves, it will grow no taller than 10-12 in (25-30 cm). Given strong lighting and a nutrient-rich substrate, the plant will develop attractive pale red-brown markings. Below: Echinodorus 'Tricolor' is another cultivated variety, with bold, oval leaves. In common with most large Echinodorus species, it needs good lighting and an iron-rich substrate for strong growth. The leaves are attractive shades of green, which add variety to the aquarium display. Special note: Elodea is found in many temperate and subtropical regions throughout the world as an introduced, or "alien" species, meaning a species that does not originate from the area it is found in. In many places, particularly in Europe, fast-growing, adaptable plants such as elodea can spread quickly and cause major damage to native plants and wildlife. Therefore, it is vital that aquarists behave responsibly and do not allow aquarium plants to reach open waterways, rivers and lakes. 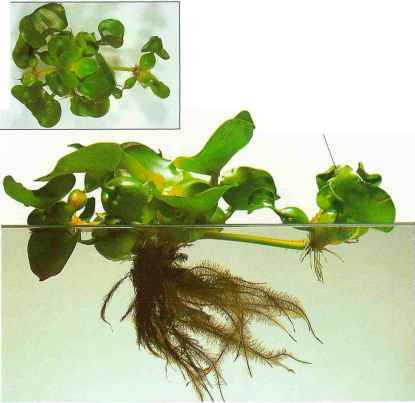 This is one of the best-known and popular aquatic plants. 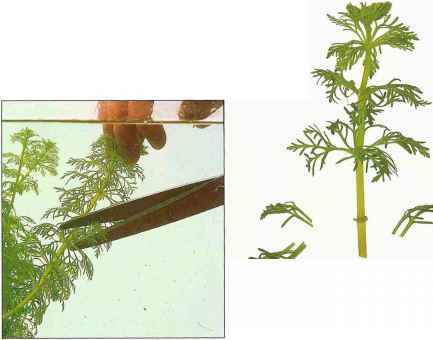 Elodea is highly adaptable, fast growing, and one of the easiest aquatic plants to keep. 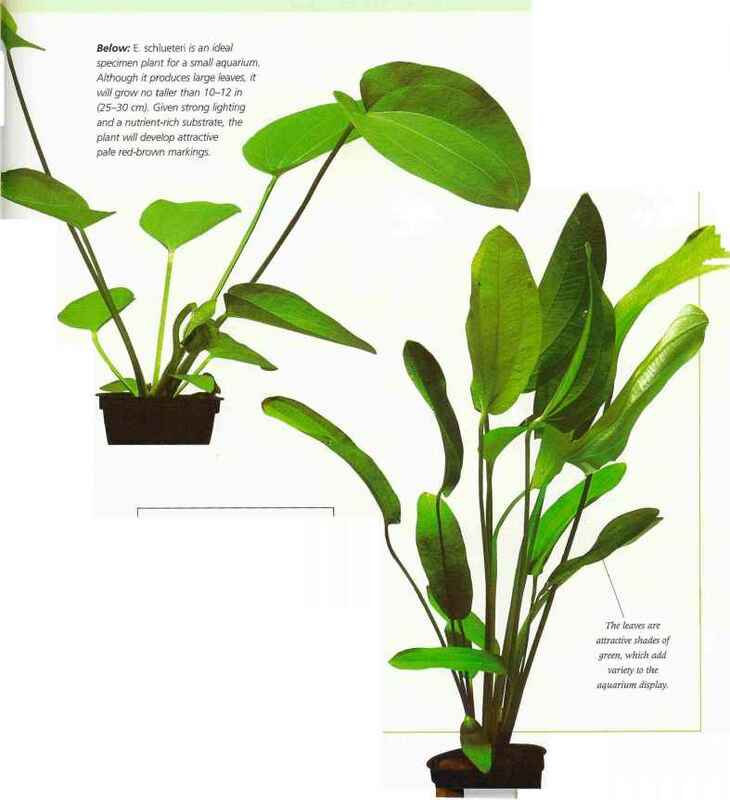 Ideally, it prefers harder water, but will adapt to a wide range of water conditions and temperatures. 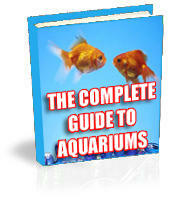 With good lighting, elodea can be kept in aquariums with higher temperatures. Left: An overhead view shows the amount of cover provided by the plant, which is very welcome to the fish beneath the sudace. Plantlets are often produced from shoots and in good conditions, these may need regular thinning.